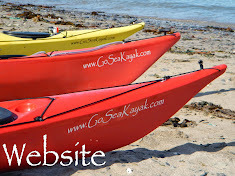 Not a planned paddle this, I was chilling at St Brides Haven preparing for a lazy day when a familiar face turns up with a kayak on the roof of his car, it was Steve Bunston & he'd brought some mates too of which only Neil I knew. We left St Brides Haven early'ish & onto glassy sea's. I had no time to plan anything & was loving taking a back seat leaving Steves planning to lead the way. We enjoyed some gentle rock-hopping en route to Jack sound. Making the crossing to Skomer. Couldn't be calmer out here & certainly no drama. A quick discussion to discuss Steves tidal planning. Approaching the Mew Stone at South Haven. Break time at North Haven. A gentle paddle back to end a fab & unexpected day out & only my second circumnav of Skomer. Two weeks without an update! Taran are you OK?